Mark Ingram carries several Bills defenders into the end zone on one of his three touchdown runs on the day. The first inkling I had that this Saints team might be special was when left tackle Terron Armstead injured his labrum in the offseason. I should explain by way of one of my favorite proverbs, one that’s referenced in both Taoist and Buddhist writing, and one that, if you saw last week’s episode of The Last Man on Earth, you’re familiar with already. It has a few names, but it is mostly known as the parable of the Chinese Farmer. Good thing, bad thing. Who can say? This April, when the Saints were on deck with the #32 pick of the draft, Seattle was on the clock. Expecting Seattle wouldn’t take a linebacker, the Saints called Alabama’s Reuben Foster– the draft’s top middle linebacker prospect, a position long considered a key need for New Orleans– to let him know they would be selecting him. The Saints were correct; the Seahawks had no intention of taking Foster. The Saints, subsequently, selected Wisconsin tackle Ryan Ramczyk, a player who had been unable to work out at any point in the pre-draft process due to a shoulder injury, and who would be projected to back up Armstead and right tackle Zach Strief. When the story of the Saints calling Foster came out, fans of other teams and some media members got a chuckle at the Saints getting egg on their face. The resulting Ramczyk pick left many of the Saints’ own fans perplexed, if not incredulous: This is why we traded Brandin Cooks? For a luxury player who probably won’t see the field year one? Who we don’t even know is healthy enough to play? Armstead’s June injury required surgery and placed him on the Physically Unable to Perform list to start the season. Ramczyk, without even much preseason experience, had to step in and play NFL left tackle from day 1. Astoundingly, he did quite well, rarely allowing pressure in his time there despite the position’s rather steep learning curve. Eventually Armstead returned, but then Strief went down with a knee injury. Strief was a longtime mainstay and the final tie to New Orleans’ 2006 draft class, the one that eventually helped them win the Super Bowl. * It was something of a symbolic goodbye to that era; Drew Brees and Thomas Morstead were the only players on that Super Bowl roster who have remained with the team to this day. ** Of course. As soon as we get to full strength, the other one gets hurt. *Appropriate, then, that he be replaced by a member of the 2017 class, which is shaping up to be similarly great. ** Backup quarterback Chase Daniel has also returned after stints in Kansas City and Philadelphia. The team signed defensive tackle Nick Fairley to a four-year, $28 million contract after he played well on a one-year deal last season, only to see doctors discover a previously undiagnosed heart condition which caused him to miss the season (and may demand his retirement). Same old Saints. Overpaying free agents and getting nothing for it. In his absence, second-year player David Onyemata has stepped up as an interior penetrator on the defensive line, among the league leaders in total tackles behind the line of scrimmage (counting both run plays and sacks), despite only playing about half of the defensive snaps on the year. Marshon Lattimore missed week 3 against Carolina with an injury. The fans held their breath: This is why we’re 0-2. We spend high draft picks on injured players. We act like we’re always one player away, when we’re not. In Lattimore’s absence, Ken Crawley stepped into the starting lineup, and played outstanding football, notching two passes defensed as well as leading the team in tackles. Crawley started next week in London against Miami after P.J. Williams was benched for a violation of team rules, and his end-zone interception on the Dolphins’ first drive killed their best chance of scoring in a 20-0 shutout. After those two performances, Crawley took a permanent spot in the starting lineup, forcing the oft-burned De’Vante Harris and the actually-pretty-good Williams to the bench. It seems like so many of the breaks a team needs have gone the Saints’ way so far. Injuries are inevitable; having a good player behind the starter isn’t. Discovering a good player because of an injury is rarer still. The Saints have been getting lucky with opponent selection, too, as quarterbacks seem to incur injuries just before they play New Orleans. But you always need breaks to win the Super Bowl, as I mentioned previously. The simple fact is, winning a road game 47-10, against any other team in the National Football League, is extremely difficult– let alone winning one against a 5-3 team. For comparison, the 0-9 Cleveland Browns’ worst home loss this season is by 31-7 to Cincinnati in week 4. That’s 24 points; the Saints just beat the Bills by 37 points. The previous worst home loss this year was the New York Giants’ 51-17 drubbing at the hands of the Los Angeles Rams in week 9. The Giants are now 1-8 and just lost to a certain previously 0-8 team that now employs Reuben Foster. Again, the Bills still have a winning record after the loss to the Saints. Dominated isn’t even the right word: Like a mad scientist whose ransom demands aren’t met, the Saints fired their Doomsday Laser at Orchard Park on Sunday, leaving only a smoking, scarred crater of an opposing football team and its fans’ dreams. With that working in the running game– as well as Kamara catching all five of his targets for 32 yards– the Saints didn’t need much in the passing game. When they did, Michael Thomas was open; he caught nine of his ten targets for 117 of the Saints’ 184 passing yards, including two difficult grabs downfield that showed off his body control, awareness, and sure hands, and converted important first downs. Until a last minute drive in garbage time led by rookie backup Nathan Peterman with the Saints already leading 47-3, New Orleans held Buffalo to an astonishing 3.15 yards per play and five first downs, compared to the Saints’ own 6.9 yards per play (excluding kneeldowns) and 32 first downs. The Saints completely dominated this game defensively, one early LeSean McCoy run and one early Tyrod Taylor run aside. Receivers were never open. New Orleans forced the Bills into long down-and-distance situations and forced Taylor to settle for checkdowns on third-and-long. Though the Saints only sacked Taylor twice, they frequently pressured him into running or scrambling until he could force a low-percentage throw or a throwaway. The defensive line tipped three passes, and Sheldon Rankins nearly scored a touchdown when he dropped into coverage and intercepted a pass. 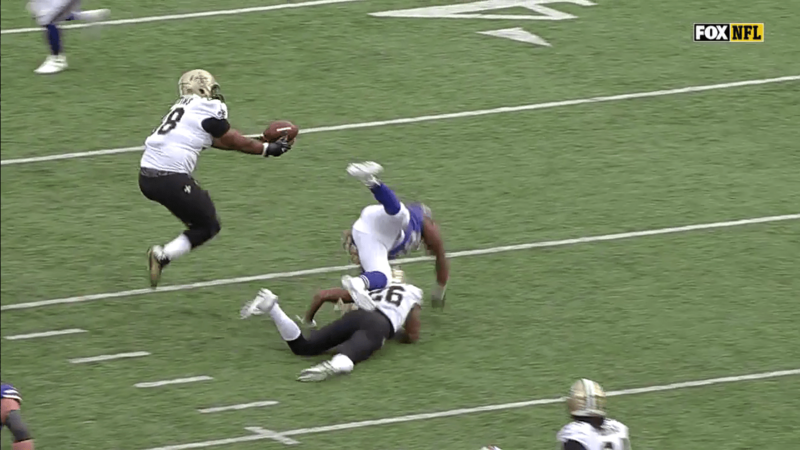 Sheldon Rankins leaps to make an interception off a tipped pass. Rankins would nearly return the pick for a touchdown. When the Saints started the season 0-2, I believed we’d be in for more of the same. Another round of gutting the offense to try to patch the defense. Another round of failing to do so and just ending up with one mediocre unit and one bad one. Another round of players being misused by the coaches. Another round of 7-9. Instead, the adjustments the team has made since then have them humming along at peak efficiency. The best players are getting on the field. The team is largely putting them in position to succeed. (We still got one classic “too clever by half” Sean Payton result this week: A designed unblocked screen for backup tight end Josh Hill, who fumbled after the catch at the Bills’ 9.) And the best players are good enough to win football games. The team has won seven in a row since starting 0-2, a feat only matched by the 1993 Dallas Cowboys, who went on to win the Super Bowl.